One of the drawbacks to being a freelancer is that work is always on your mind, regardless of whether you are at your desk or not. There is always a task to be completed or an email that needs a reply and this can lead to the ‘business mode’ switch being constantly on. 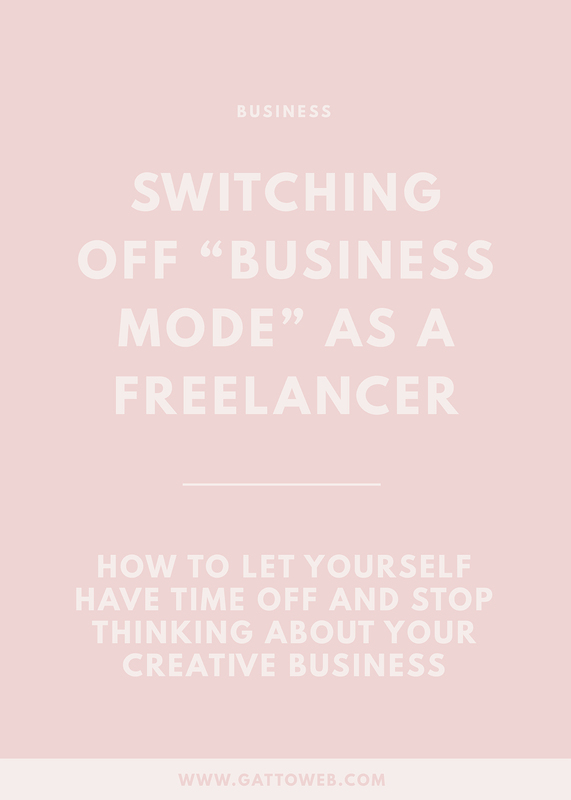 In the past nearly two years of being a full time business owner, I have found a few ways to turn that switch off and relax as much as possible in the evenings or at weekends. After all, being a freelancer is all about the freedom so we should take advantage of that! In a past post I have mentioned that something I don’t stick to as a creative freelancer is having set hours. By this is mean that I don’t decide to work Monday to Friday 9-5 and then beat myself up about it if I need some time off. Part of being a freelancer is having the flexibility to make your own hours and basically do whatever you want! Something I do to make sure I still have a schedule is set my hours at the beginning of each day. If I know I have something to do in the afternoon, I will set myself the morning working and then give myself the afternoon to get my chores done. I’ve set the hours in my mind in the morning, I make sure this is what I stick to. That way, you can switch off your laptop and your mind and relax when you are finished. Tip: When you know what hours you want to work on each day, write it down in a notebook or on your calendar and then you know exactly when you want to be finished and don’t go over the time. We’ve all been there, we spend the day staring at a screen whether it is a laptop, tablet or computer and then after breathing a sigh of relief and stepping away, you then go and stare at your phone for a few hours. This is something I do on a regular basis and not only does it mean I still end up focusing on work related tasks but my brain doesn’t really get a chance to switch off and relax. My advice would be to step away from ALL devices. Put your laptop away, put your phone on charge and give yourself a break from the glaring light of a screen. That way, even if you wanted to check your emails, you can’t and this gives you a better chance of unwinding from work. Tip: Have a box or drawer in your house where you keep all devices and put them away when you are finished working so you don’t have the temptation of ‘just checking’ anything. I don’t know about you but I find it much easier to stop thinking about work when I am out and about. Getting away from your house or office means you are much less likely to think about work and even if you do – there’s nothing you can do about it so you are forced to stop yourself worrying! If you find yourself going stir crazy at home with all of the work tasks going round in your mind, it is best to get yourself out of that environment. Take your other half out for dinner, go and see your mum for a cup of tea or take your dog out for a walk! I assure you this will make most of your worries go away and you will feel more relaxed when you get home. Tip: Turn off notifications on your phone when you are out so you don’t get any work emails or messages which put you back in business mode. If you have a personal involvement in every single part of your creative process, chances are there is always something work related on your mind. Whether it’s sending out a client form, an invoice reminder or sharing your latest blog post, there is always a small task to get done at any given time. If you have automation systems in place for your business which do the work for you, you will have less tasks to worry about and so in turn you will have less on your mind. Automation has changed my business completely and allowed me to minimise my workload to the point where my main tasks are designing. Reducing your workload will be a big step towards switching off as you know your business is working for you whilst you put your feet up! Tip: Spending a day or two putting your automating systems in place will save you hours in the future and is definitely worth the time. Having a hobby outside of work can benefit you for several reasons. It can help you boost your productivity, increase your self-care and most of all occupy your mind away from work. Although I am currently going through a quest to find a hobby which I truly love, in the meantime I find solace in reading and puzzle books to keep my mind occupied so I’m not thinking about work. Tip: Whatever you decide you want to do as a hobby, the best ones are away from your screens and away from your desk so keep that in mind. Ok, quick disclaimer, I rarely do either of these things so I don’t have a personal account of them helping me. However, whenever I tell another business owner that I am feeling burnt out or stressed, meditation and exercise are the two things that seem to help most people. Both of these things are designed to completely relax you and take your mind away from work, stress and everything in between. Tip: At the end of your working day, take some time out to meditate by yourself, or head out for a run and this will mark the end of work for that day. Once you get into this routine, it will feel easier to switch off when you are done. How do you switch off 'business mode' at the end of your work day? If you have any more tips, add them in the comments below!